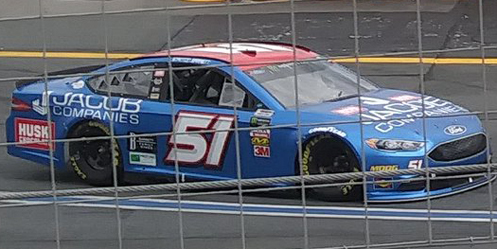 Stanton Barrett picked up the 4th last-place finish of his Monster Energy NASCAR Cup Series career in Sunday’s Bank of America Roval 400 at the Charlotte Motor Speedway “Roval” Road Course when his #51 Jacob Companies Ford fell out in a single-car accident after he completed 11 of 109 laps. The finish, which came in Barrett’s 23rd series start, was his first in a Cup Series race since Martinsville on October 23, 2005, 464 races ago. 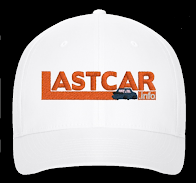 In the Cup Series last-place rankings, it was the 22nd for car #51, the 685th for Ford, and the 574th from a crash. 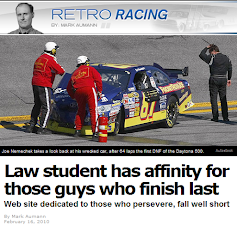 Across NASCAR’s top three series, it was the 34th for the #51, the 944th for Ford, and the 1,165th from a crash. Barrett, the second-generation stuntman and movie director from Bishop, California, has been running part-time in NASCAR’s top three series since 1992. A journeyman driver, Barrett has driven for a number of teams, including Donlavey Racing, Front Row Motorsports, and his own operation. 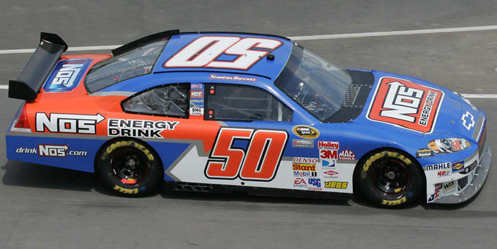 Perhaps his most notable NASCAR ride was Roush-Fenway’s #60 team, which he drove for in the first part of the 2003 Busch Grand National season, earning back-to-back poles at Las Vegas and Darlington with a season-best 6th-place finish at the Nashville Superspeedway. Now 45 years old, Barrett hadn’t been entered in a Cup race since September 21, 2008, when he last entered Chris Lencheski’s #50 Chevrolet sponsored by NOS Energy Drink, and hadn’t started one since September 24, 2006, when he finished 35th in Jeff Stec’s #61 Oak Glove Co. Dodge – both of these in the fall race at Dover. Instead, Barrett has focused on his film career through his company Barcode Entertainment. The company’s latest film, “Navy Seals vs. Zombies,” was promoted in a number of XFINITY Series starts Barrett made for Rick Ware Racing in 2015. 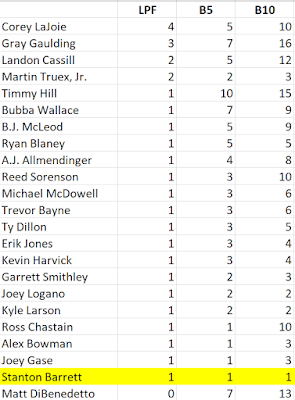 These races were among the 29 combined XFINITY and Truck Series starts Barrett made since 2009, most recently a 27th-place run at Road America for B.J. McLeod’s team on August 27, 2016. Last Wednesday, Barrett was swapped in for B.J. 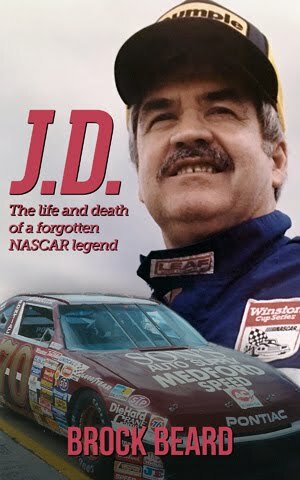 McLeod as driver of Rick Ware’s #51. It was a return to Cup competition nearly two years in the making – Jayski.com tweeted on January 20, 2017 that Barrett would be part of the Ware team’s lineup along with Cody Ware and Kevin O’Connell. 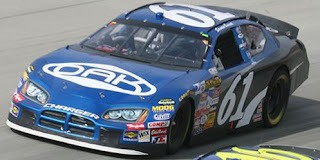 Since that time, Ware obtained a Charter for his flagship #51, and this past June at Sonoma added a second car, the #52. Following Gray Gaulding’s brake issues last Saturday in Richmond, Ware would leave the #52 at the shop and enter Barrett in what, by its glossy blue paint scheme, appeared to be the same #51 Josh Bilicki ran at Watkins Glen. Among the 40 entrants, Barrett began the weekend next-to-last in the opening practice, then ran 38th of 39 in the second session with the slowest completed lap. He was again next-to-last in qualifying with a lap of 100.255mph (1 minutes, 21.871 seconds) and did not participate in Happy Hour on Saturday. Despite struggling for speed, Barrett arrived on the grid Sunday without involvement in any of the weekend’s major incidents. Five drivers were sent to the rear of the field, four of them in backup cars due to hard accidents. Denny Hamlin in the #11 FedEx Freight Toyota endured a miserable Friday where he first popped the “turtles” exiting the backstretch chicane, then in qualifying lost control in the same corner and hit the right-rear on exit, knocking off the rear decklid. Darrell Wallace, Jr. spun out four times on Friday, then early Saturday destroyed his #43 World Wide Technology Chevrolet hitting the tire barrier at the exit of the same chicane. The same barrier caught Erik Jones twice – first on Friday, when he sideswiped the driver’s door, and then on Saturday, when he wrecked the #20 Resers Toyota. Last of the totaled cars was the #2 Alliance Truck Parts Ford of Las Vegas winner Brad Keselowski, who missed the exit of the final chicane and ran head-on into the frontstretch wall. Regan Smith joined the group in the rear for an engine change on the #95 Procore Chevrolet. 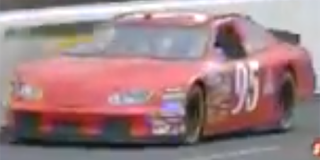 Qualified 40th on Friday was Timmy Hill, one of six drivers who ran double-duty in the inaugural “Roval” weekend. After carrying new sponsor LeithCars.com to a 32nd-place finish in Saturday’s 55-lap affair, Hill secured the final spot in Carl Long’s Cup car, the #66 Ternio Toyota. After all the penalized drivers fell to the rear, Barrett fell to the back voluntarily, joined by Ross Chastain, who also pulled out of line on Saturday, this time in Premium Motorsports’ #7 SOKAL Media Group Chevrolet. This moved Hill up to the outside of Row 19. On the break, Barrett retained the 40th spot, slotting into line behind Chastain and Hill for the treacherous Tums-sponsored “Heartburn Turn” in the first corner. The next time by, Barrett dove deep into that same turn and managed to pass both Chastain and Hill by the exit, dropping Chastain to last. The next corner, Chastain worked his way past Hill, dropping the #66 to last once more. It was around this time that Barrett flat-spotted at least one of his tires, causing NASCAR’s officials to watch the smoke coming from his machine. During the same opening run, Denny Hamlin locked-up his brakes in the front chicane, flat-spotting the left-front tire and causing his car to smoke in the same way. Hamlin made an unscheduled stop to change tires and dropped to 40th behind Barrett. By Lap 6, Barrett, who NASCAR had cleared after his earlier smoking, pulled to the low side on the backstretch and slowed. Officials instructed Barrett to pull in to the infield on the backstretch, but the #51 made it onto pit road for a tire change. This dropped Barrett back to last, and also made him the first to lose a lap. The Rick Ware crew reported that the tire was flat-spotted all the way to the cords. Barrett continued around the track until Lap 13, when the brakes locked up. Much like J.J. Yeley’s incident in XFINITY practice, the car went straight into the barrier, destroying the front of the car. Barrett was agitated on the radio, saying “to the right,” reportedly about an issue adjusting the brake bias. The driver climbed out unhurt, but was done for the day. The car was towed 180 degrees back to the entrance of the garage area, located near pit exit. The hits kept coming in what was ultimately a physical and wild afternoon. Finishing 39th was the #3 Dow Chemical Chevrolet of Austin Dillon, eliminated from Playoff contention after he first hit the wall in the oval’s fourth turn passing a loose Chris Buescher, then struck the barrier short of the frontstretch chicane on Lap 66. Timmy Hill held the 39th spot for much of the day, returning from an early 14-lap stay in the garage to replace the drive plate, then ultimately finished 38th with a broken axle. The 37th spot fell to Ricky Stenhouse, Jr., who damaged his #17 Sunny D Ford by hitting the wall both in practice and early in the race, then finished it off in Turn 1 on Lap 102, setting up the day’s biggest accident on the Lap 104 restart. 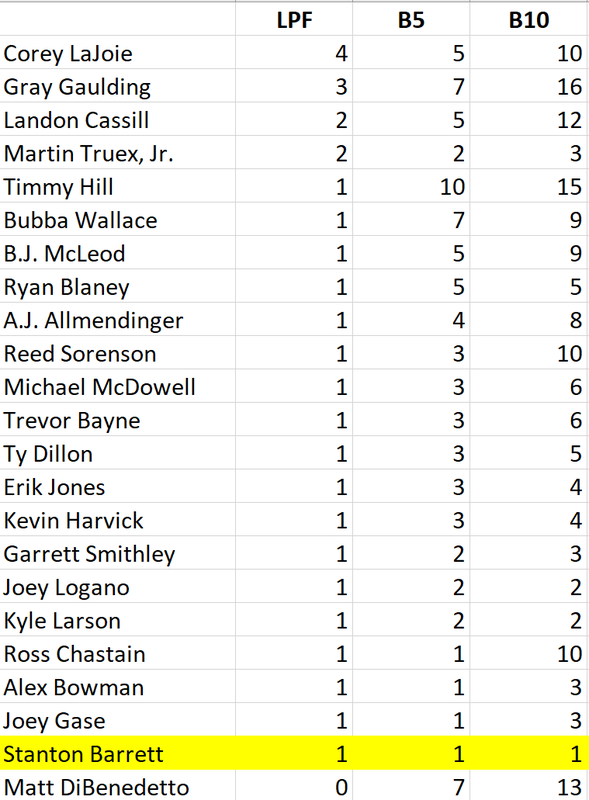 Among those collected in that 15-car pileup was 36th-place Bubba Wallace, whose backup #43 World Wide Technology was ranked last of the group. 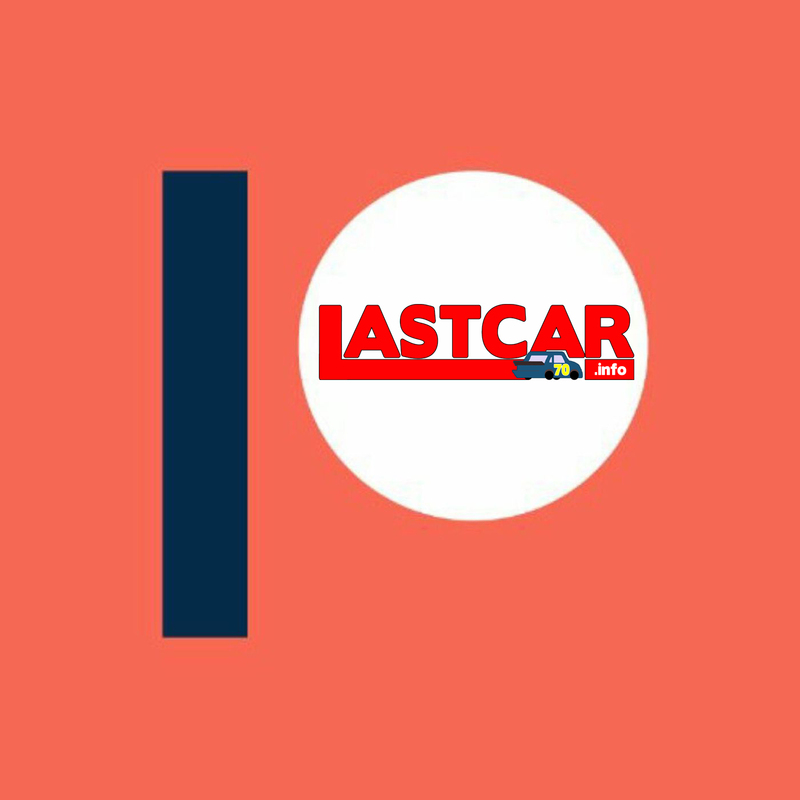 *Barrett’s mark of 12 years, 11 months, 7 days is the third-longest streak between Cup Series last-place finishes behind 2nd-place Mark Martin (14 years, 11 months, 5 days from 1982 to 1996) and leader Joe Ruttman (15 years, 6 months, 22 days from 1988 to 2004). Barrett’s streak covers the second-most races of that group, his 464 races between Martin’s 440 and Ruttman’s 494. Their bartenders are nice and friendly. We stayed till closing and weren't ushered out or anything. Definitely want to go to this event venue Atlanta again and see if their unlimited drinks brunch is worth it!